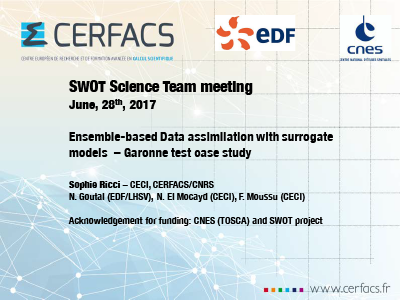 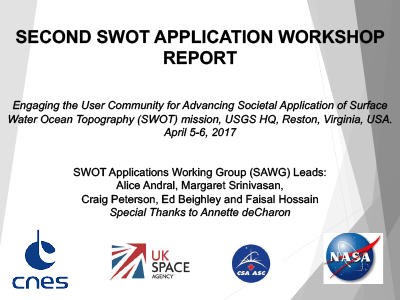 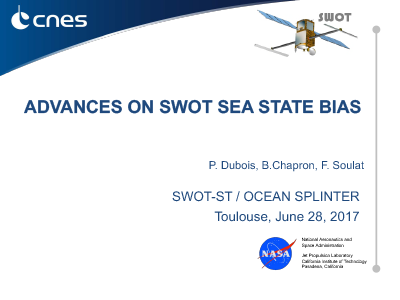 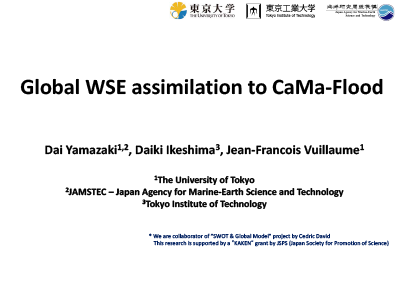 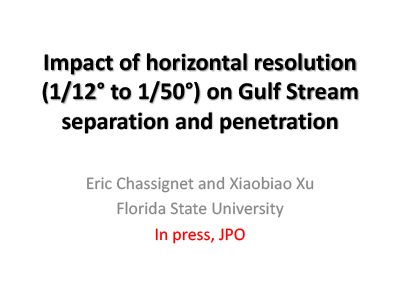 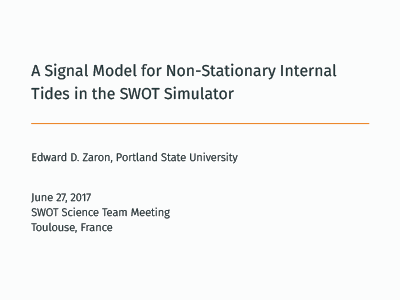 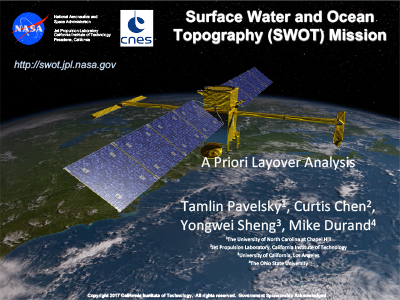 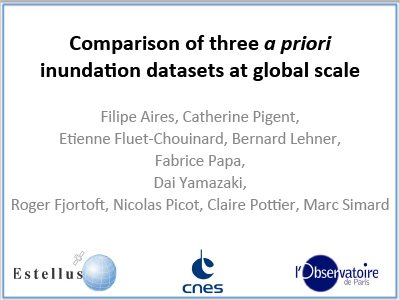 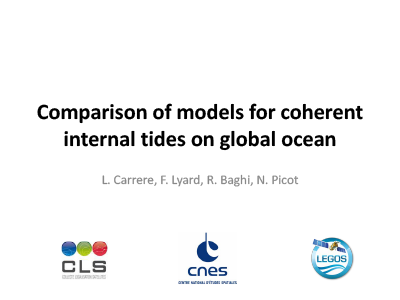 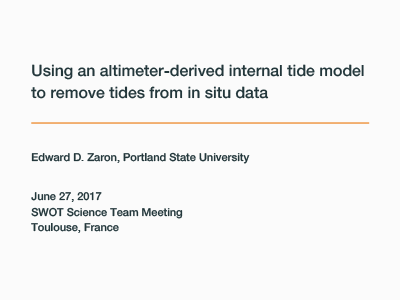 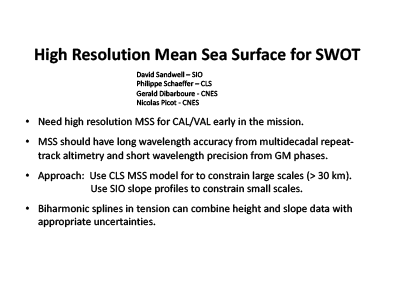 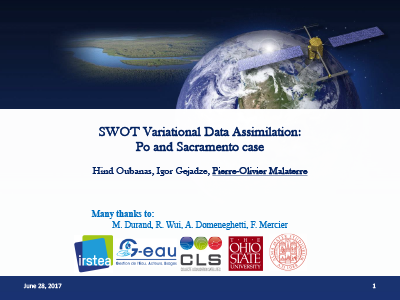 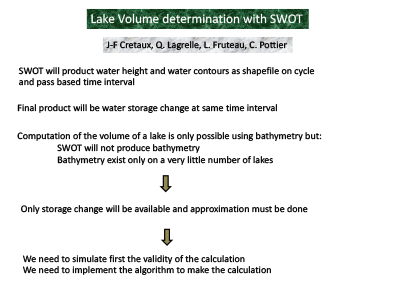 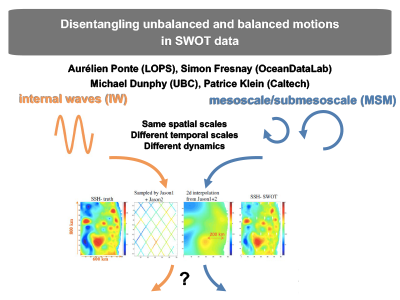 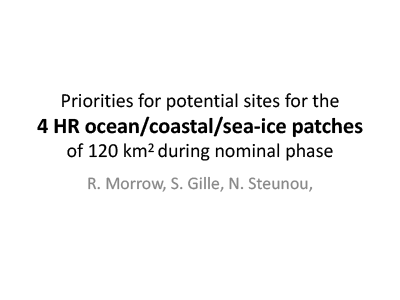 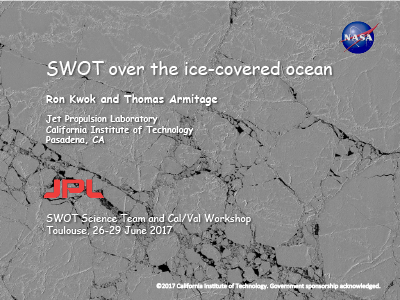 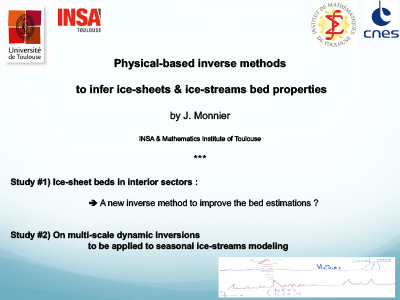 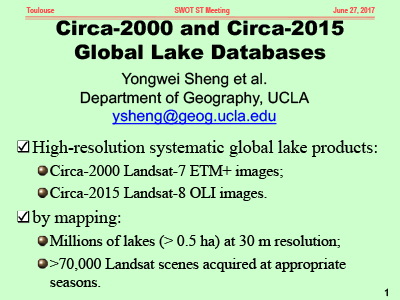 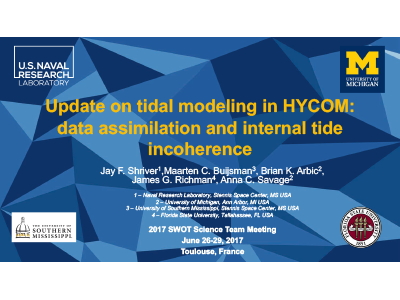 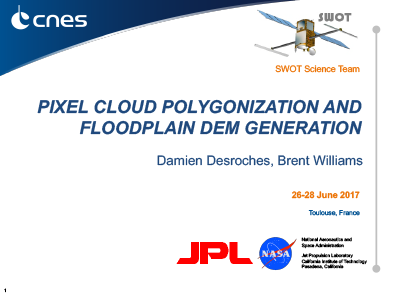 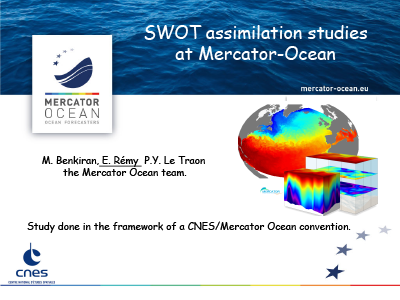 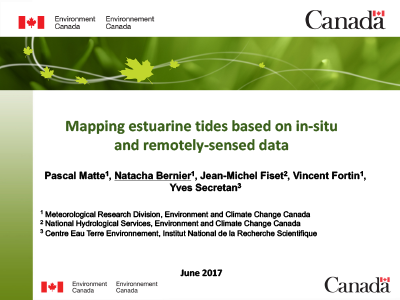 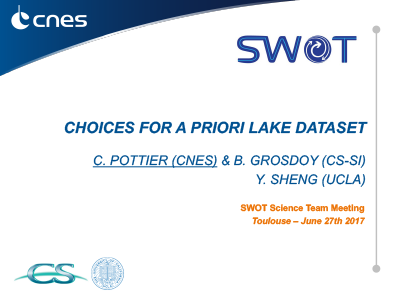 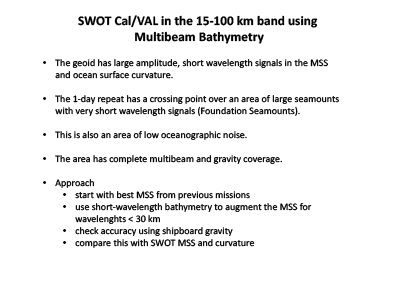 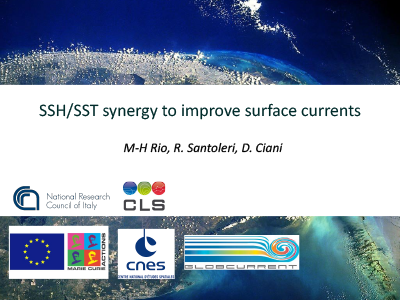 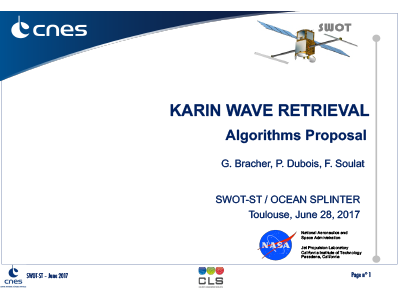 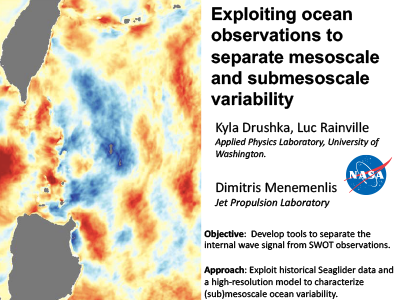 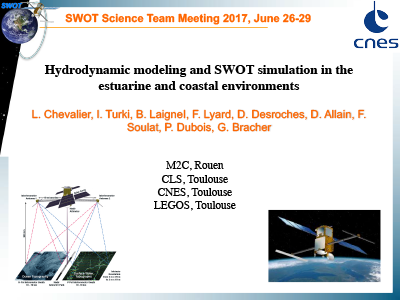 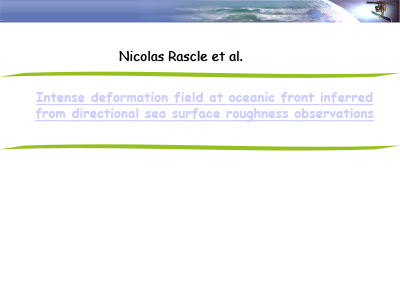 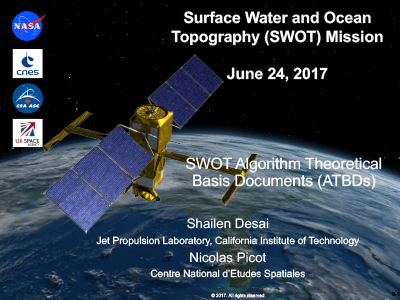 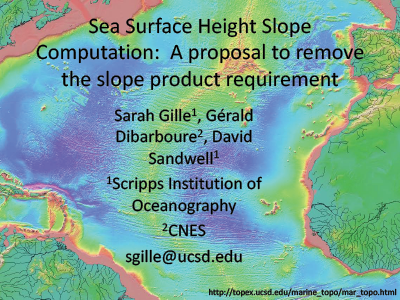 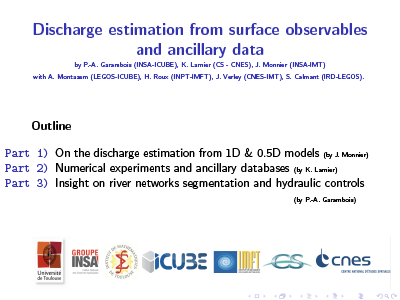 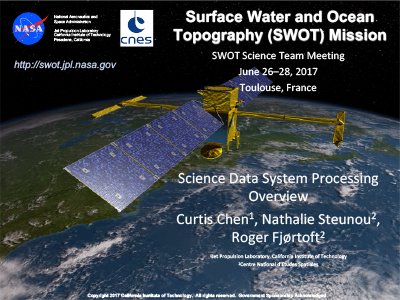 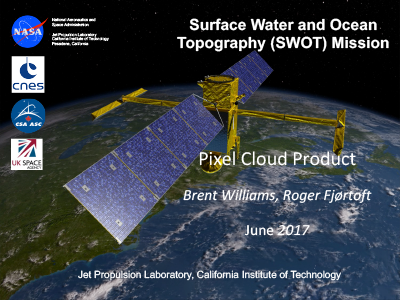 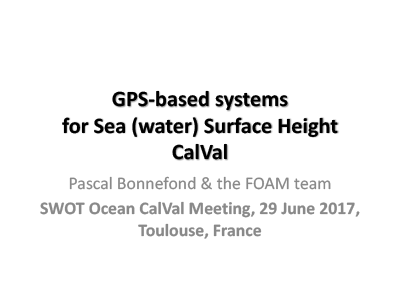 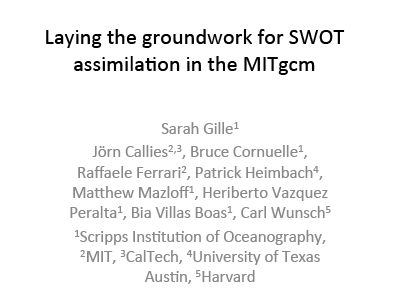 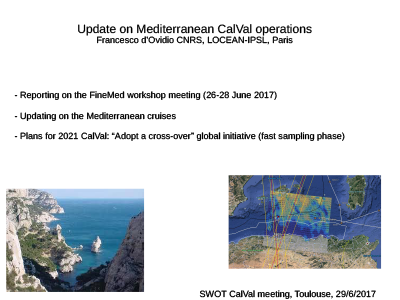 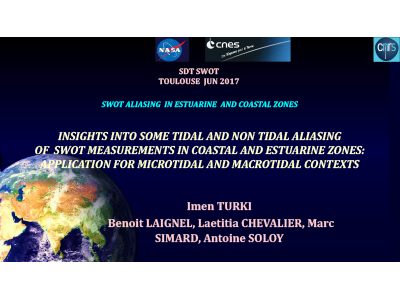 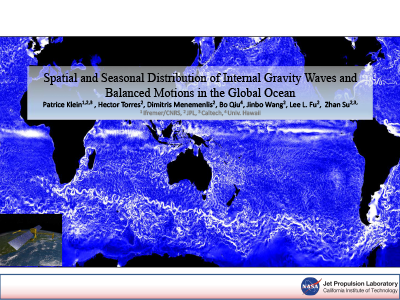 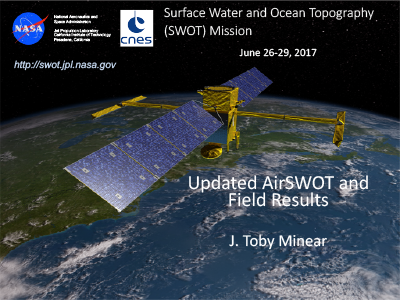 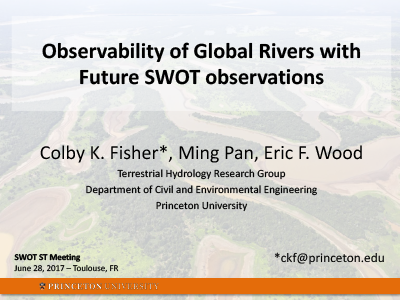 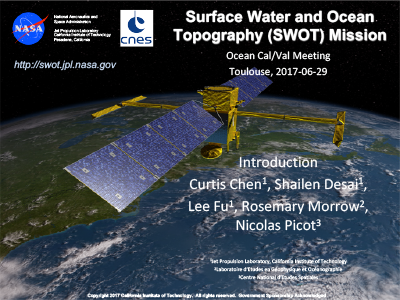 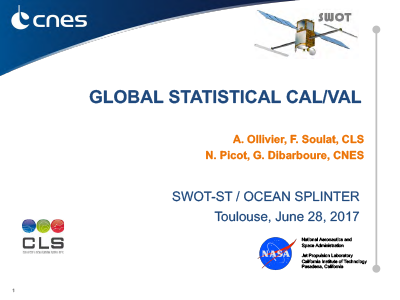 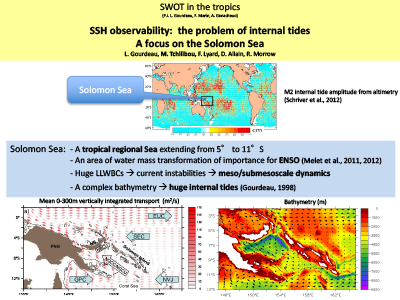 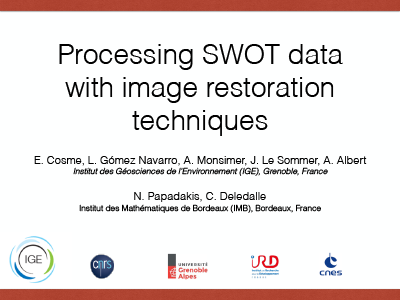 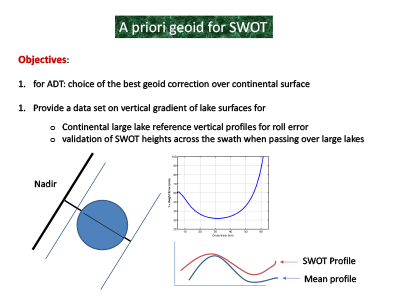 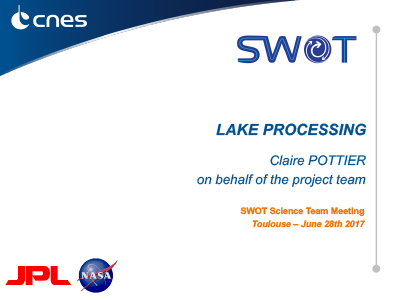 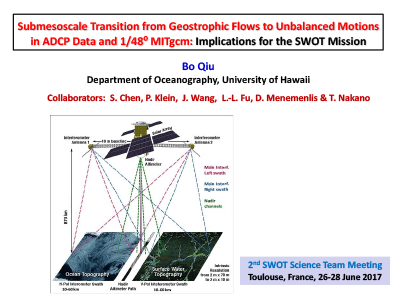 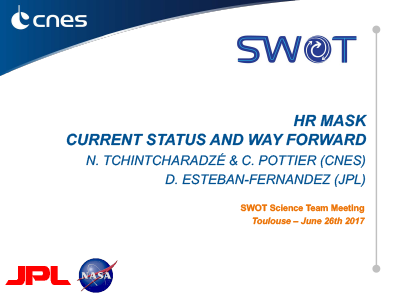 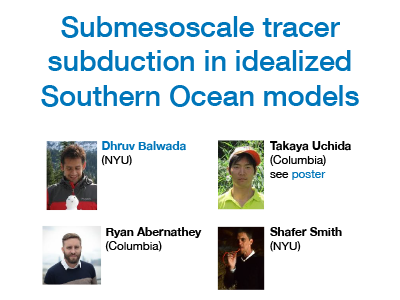 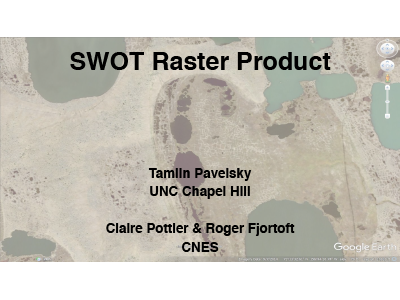 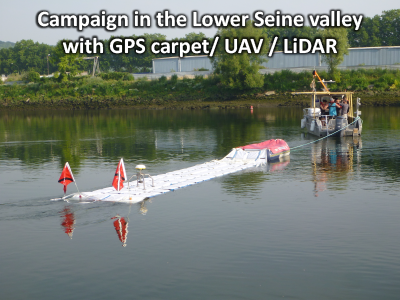 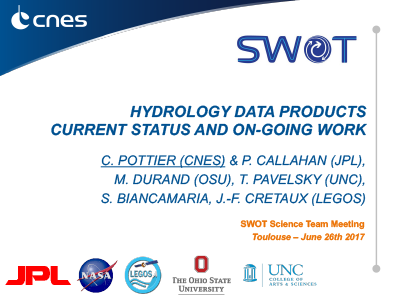 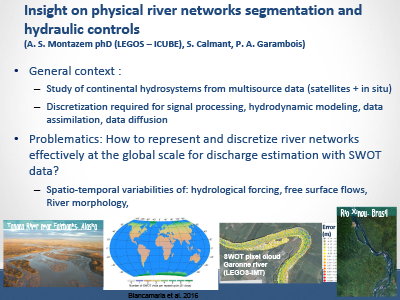 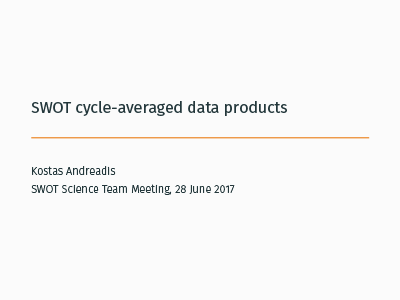 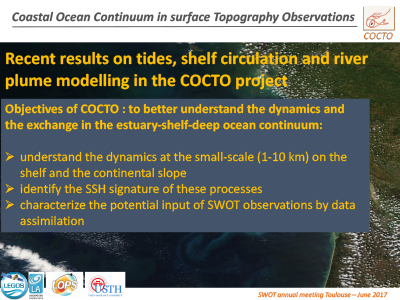 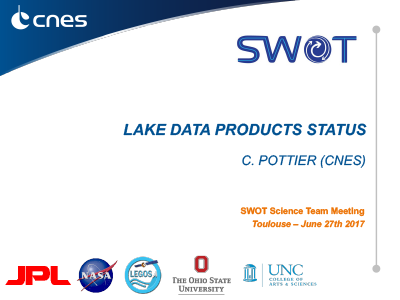 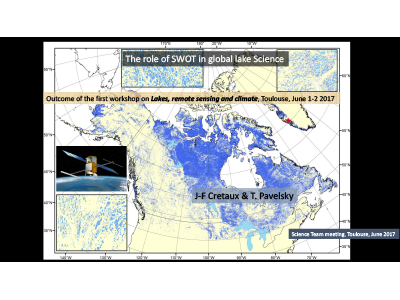 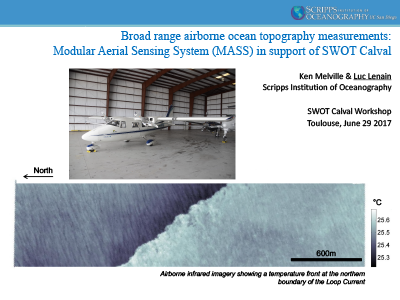 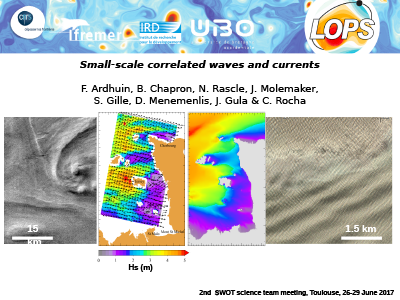 The second Surface Water and Ocean Topography (SWOT) Science Team Meeting was held in Toulouse, France, June 26-28. 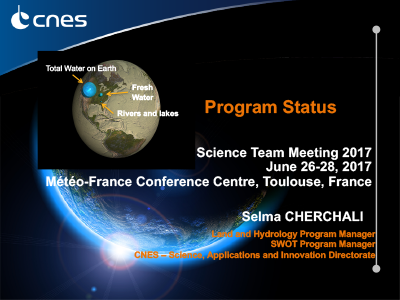 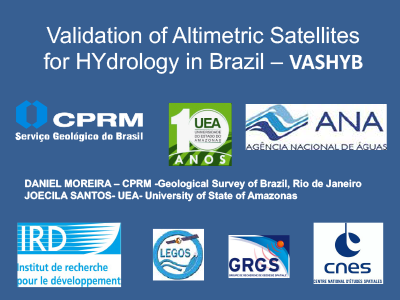 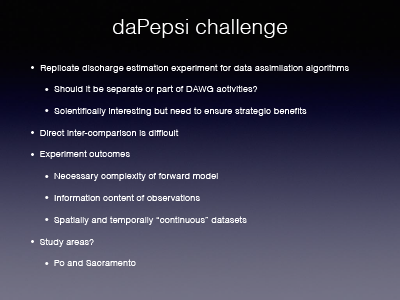 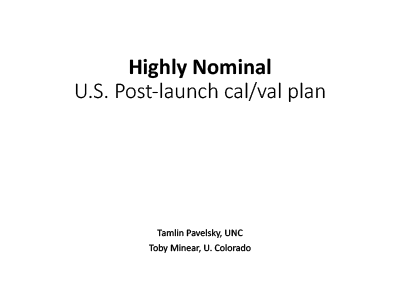 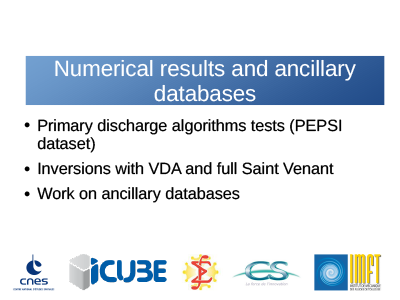 Concurrent hydrology and oceanography sessions allowed for the discussion of specific science team projects and objectives. 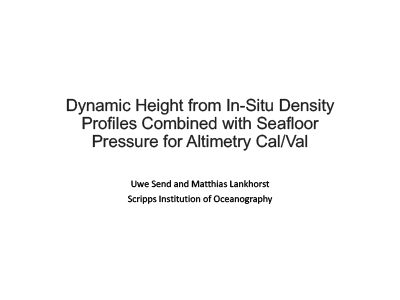 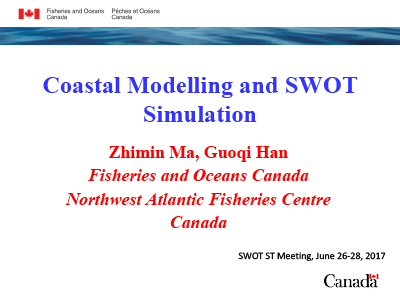 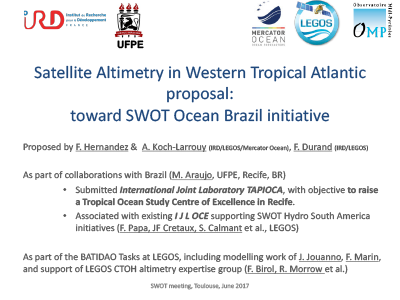 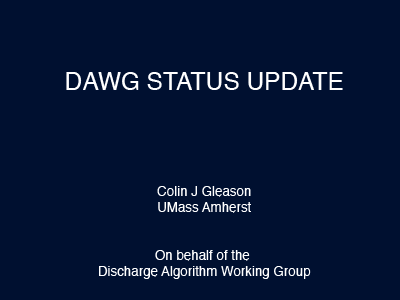 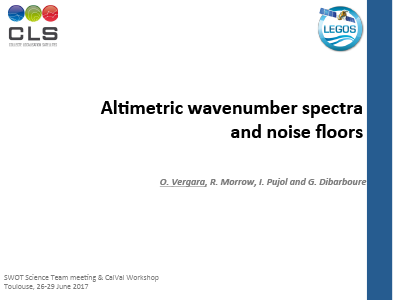 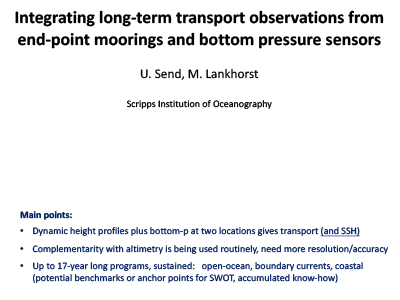 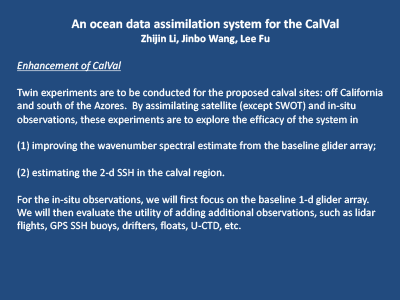 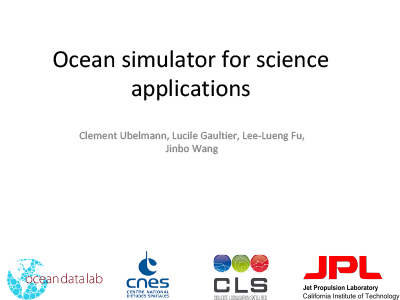 The meeting was followed by a 1-day SWOT Ocean Calibration/Validation Workshop, which took place in the same location on June 29. 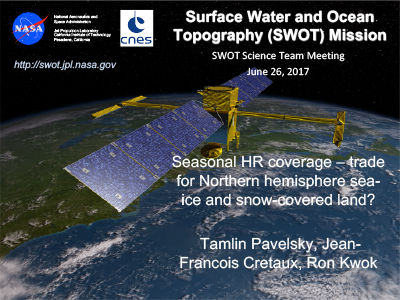 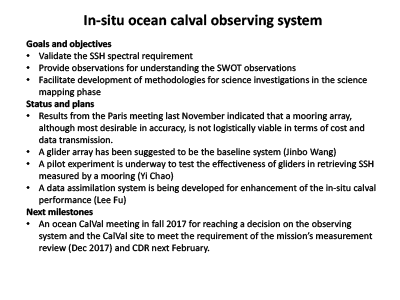 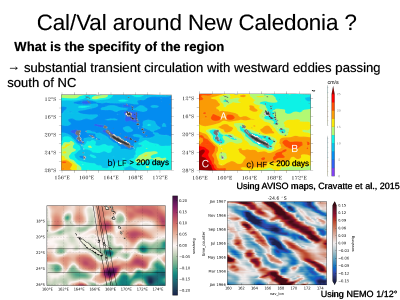 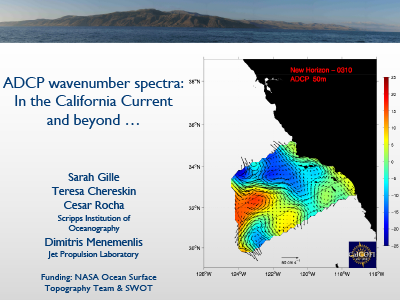 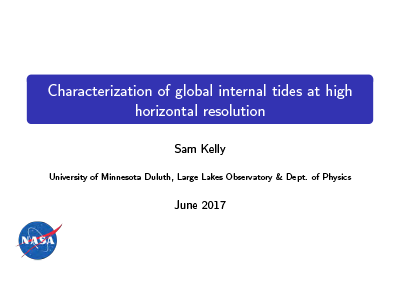 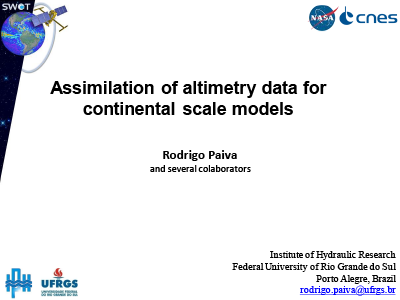 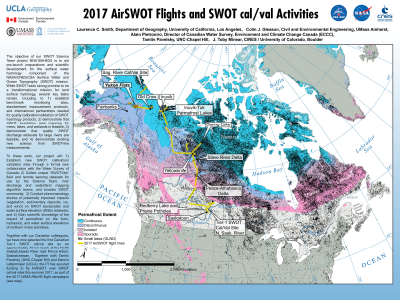 View the meeting summary in The Earth Observer (September - October 2017). [29-Jun-17] Smith, L., Gleason, C., Pietroniro, A., Pavelsky, T. and Minear, T.
[27-Jun-17] Pavelsky, T., Chen, C., Sheng, Y., and Durand, M.
[27-Jun-17] Gille, S., Chereskin, T., Rocha, C., and Menemenlis, D.
[28-Jun-17] Dubois, P., Chapron, B., and Soulat, F.
[28-Jun-17] Vergara, O., Morrow, R., Pujol, I., and Dibarboure, G.
[29-Jun-17] Li, Z., Wang, J., and Fu, L-L.
[29-Jun-17] Calmant, S. and Minear, T.
[29-Jun-17] Melville, K. and Lenain, L.
[26-Jun-17] Chen, C. and Picot, N.
[29-Jun-17] Chen, C., Desai, S., Fu, L-L., Morrow, R., and Picot, N.
[29-Jun-17] Haines, B., Desai, S., Meinig, C., and Stalin, S.
[27-Jun-17] Pottier, C., Grosdoy, B., and Sheng, Y. [28-Jun-17] Ma, Z. and Han, G.
[27-Jun-17] Carrere, L., Lyard, F., Baghi, R., and Picot, N.
[27-Jun-17] Aires, F., Pigent, C., Fluet-Chouinard, E., Lehner, B., Papa, F., Yamazaki, D., Fjørtoft, R., Picot, N., Pottier, C., and Simard, M.
[26-Jun-17] Tchintcharadze, N., Pottier, C., and Esteban-Fernandez, D.
[27-Jun-17] Fjørtoft, R., Grizonnet, M., Labat-Allee, L., Lobry, S., Pena Luque, S., Poughon, V., and Williams, B. 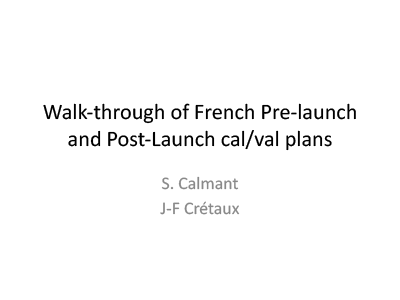 [27-Jun-17] Garambois, P-A., Larnier, K., Monnier, J., Motazem, A., Roux, H., Verley, J., and Calmant, S.
[29-Jun-17] Send, U. and Lankhorst, M.
[27-Jun-17] Ubelmann, C., Rogé, M., Morrow, R., Ballarotta, M., Faugere, Y., Dibarboure, G., and Picot, N.
[28-Jun-17] Ricci, S., Goutal, N., El Mocayd, N., and Moussu, F.
[27-Jun-17] Drushka, K., Rainville, L., and Menemenlis, D.
[29-Jun-17] Ollivier, A., Soulat, F., Mouche, A., Chapron, B., Tison, C., Picot, N., and Dibarboure, G.
[29-Jun-17] Ollivier, A., Soulat, F., Picot, N. and Dibarboure, G.
[28-Jun-17] Sandwell, D., Schaeffer, P., Dibarboure, G., and Picot, N.
[27-Jun-17] Arbic, B., et al. 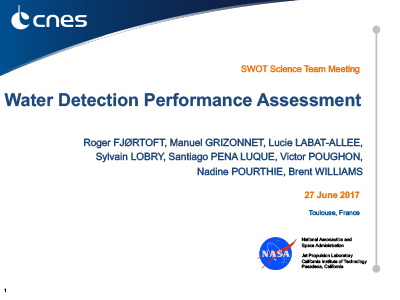 [29-Jun-17] Pavelsky, T. and Minear, T.
[28-Jun-17] Chevalier, L., Turki, I., Laignel, B., Lyard, F., Desroches, D., Allain, D., Soulat, F., Dubois, P., and Bracher, G.
[26-Jun-17] Pottier, C., Callahan, P., Durand, M., Pavelsky, T., Biancamaria, S., and Cretaux, J-F.
[26-Jun-17] Cretaux, J-F. and Pavelsky, T.
[27-Jun-17] Chassignet, E. and Xu, X. 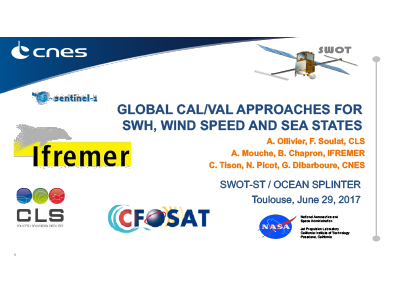 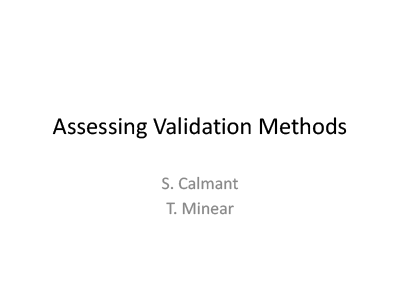 [27-Jun-17] Montazem, A.S., Calmant, S., and Garambois, P-A. 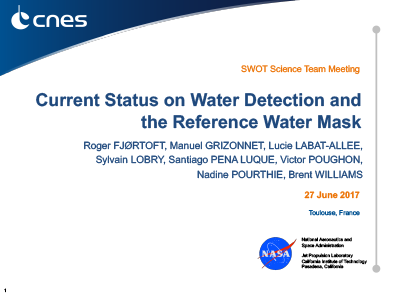 [28-Jun-17] Turki, I., Laignel, B., Chevalier, L., Simard, M., and Soloy, A. 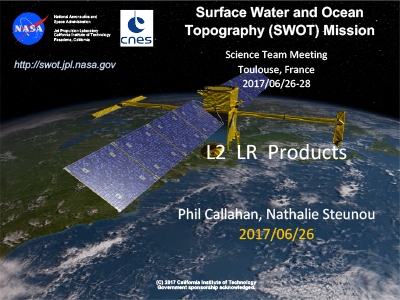 [28-Jun-17] Send, U. and Lankhorst, M.
[28-Jun-17] Rascle, N. and Chapron, B. 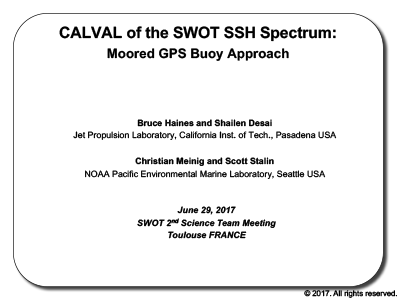 [28-Jun-17] Bracher, G., Dubois, P., and Soulat, F.
[26-Jun-17] Callahan, P. and Steunou, N.
[27-Jun-17] Gille, S., Callies, J., Cornuelle, B., Ferrari, R., Heimbach, P., Mazloff, M., Peralta, H.V., Boas, B.V., and Wunsch, C.
[28-Jun-17] Matte, P., Bernier, N., Fiset, J-M., Fortin, V., and Secretan, Y. 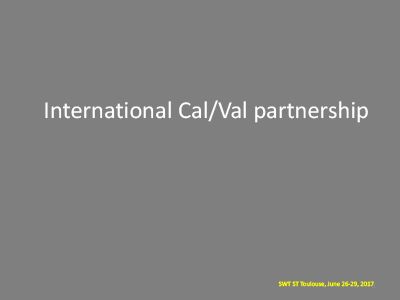 [28-Jun-17] Rodriguez, E., Perkovic-Martin, D., Gal, T., Niamsuwan, N., Stiles, B., and Wineteer, A. 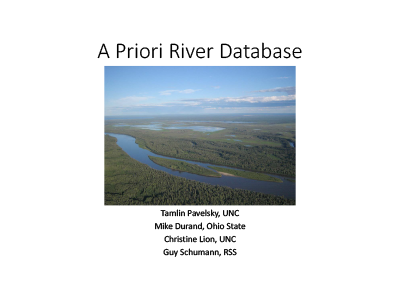 [26-Jun-17] Morrow, R., Fu, L-L., and Pavelksy, T.
[27-Jun-17] Farrar, T., Samelson, R., Savage, A., Arbic, B., and Chelton, D.
[28-Jun-17] Fisher, C., Pan, M., and Wood, E.
[26-Jun-17] Qiu, B., Chen, S., Klein, P., Wang, J., Fu, L-L., Menemenlis, D. and Nakano, T.
[27-Jun-17] Ubelmann, C., Gaultier, L., Fu, L-L., and Wang, J. 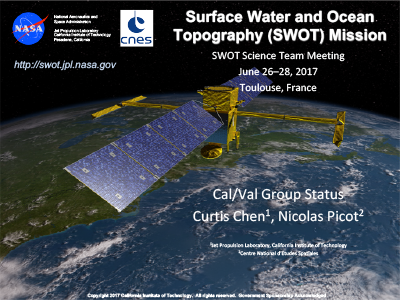 [27-Jun-17] Wang, J., Fu, L-L., and Klein, P.
[27-Jun-17] Minear, T. and Calmant, S.
[27-Jun-17] Williams, B. and Fjørtoft, R.
[27-Jun-17] Desroches, D. and Williams, B. 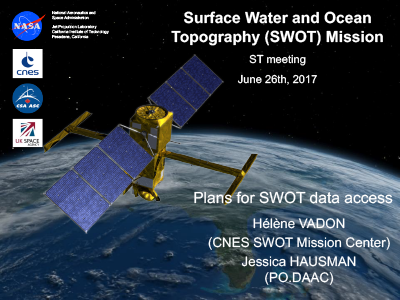 [26-Jun-17] Vadon, H. and Hausman, J. [26-Jun-17] Morrow, R., Gille, S., and Steunou, N.
[27-Jun-17] Cosme, E., Gomez Navarro, L., Monsimer, A., Le Sommer, J., Albert, A., Papadakis, N., and Deledalle, C.
[26-Jun-17] Lindstrom, E. and Cherchali, S.
[27-Jun-17] Pavelsky, T., Durand, M., Lion, C., and Schumann, G.
[26-Jun-17] Vaze, P. and Lafon, T.
[27-Jun-17] Pavelsky, T., Pottier, C., and Fjørtoft, R.
[28-Jun-17] Simard, M., Liu, K., Jensen, D., Rodriguez, E., Jones, C., Laignel, B., Castañeda, E., Christensen, A., Lyon, C., and Pavelsky, T.
[28-Jun-17] Esteban-Fernandez, D., Chen, C., Peral, E., Rodriguez, E., Stringham, C., and Wu, X. 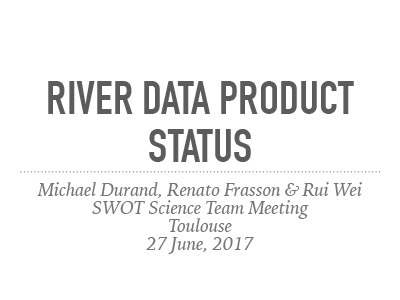 [27-Jun-17] Durand, M., Frasson, R., Wei, R.
[28-Jun-17] David, C., Andreadis, K., Famiglietti, J.S., Beighley, R.E., Boone, A., Yamazaki, D., Kim, H., Fiset, J-M., Rodriguez, E., Biancamaria, S., Paiva, R., and Fisher, C.
[28-Jun-17] Hernandez, F., Koch-Larrouy, A., and Durand, F.
[27-Jun-17] Le Sommer, J., Adekunle, A., and Cosme, E.
[26-Jun-17] Chen, C., Steunou, N., and Fjørtoft, R.
[26-Jun-17] Desai, S. and Picot, N.
[26-Jun-17] Gille, S., Dibarboure, G., and Sandwell, D.
[26-Jun-17] Pavelsky, T., Cretaux, J-F., and Kwok, R.
[26-Jun-17] Hossain, F., Andral, A., Srinivasan, M., Peterson, C., and Beighley, E.
[28-Jun-17] Ardhuin, F., Chapron, B., Rascle, N., Molemaker, J., Gille, S., Menemenlis, D., Gula, J., and Rocha, C.
[27-Jun-17] Klein, P., Torres, H., Menemenlis, D., Qiu, B., Wang, J., Fu, L-L., Su, Z. 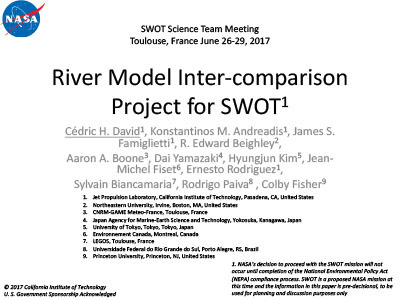 [27-Jun-17] Gourdeau, L., Tchilibou, M., Lyard, F., Allain, D., and Morrow, R.
[28-Jun-17] Rio, M-H., Santoleri, R., and Ciani, D.
[26-Jun-17] Chen, C., Pavelsky, T. and Morrow, R.
[29-Jun-17] Smith, L. and Minear, T.
[27-Jun-17] Benkiran, M., Rémy, E., and Le Traon, P-Y. 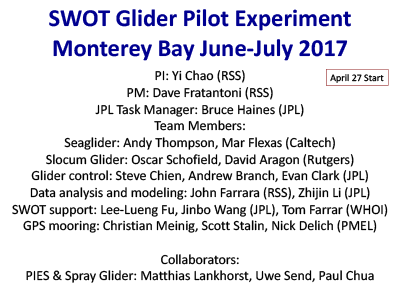 [29-Jun-17] Chao, Y., Fratantoni, D., and Haines, B. 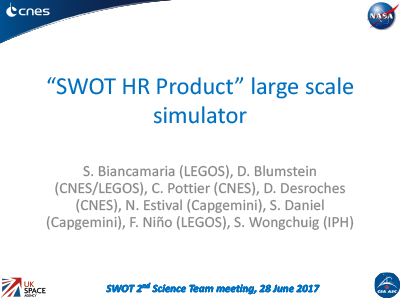 [27-Jun-17] Sheng, Y., Ke, L, Song, C., and Lettenmaier, D.
[28-Jun-17] Biancamaria, S., Blumstein, D., Pottier, C., Desroches, D., Estival, N., Daniel, S., Niño, F., and Wongchuig, S.
[29-Jun-17] Wang, J., Fu, L-L., Qiu, B., Menemenlis, D., Farrar, T., Chao, Y., Thompson, A.F., and Flexas, M.M. 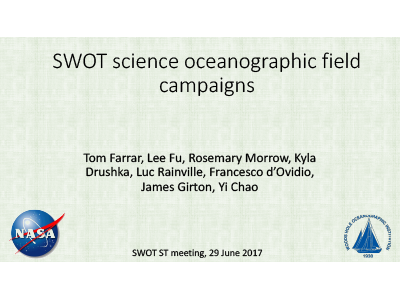 [29-Jun-17] Farrar, T., Fu, L-L., Morrow, R., Drushka, K., Rainville, L., d'Ovidio, F., Girton, J., and Chao, Y. 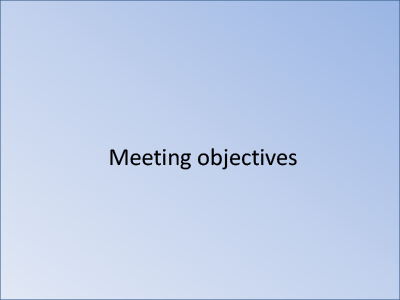 [28-Jun-17] Oubanas, H., Gejadze, I., and Malaterre, P-O. 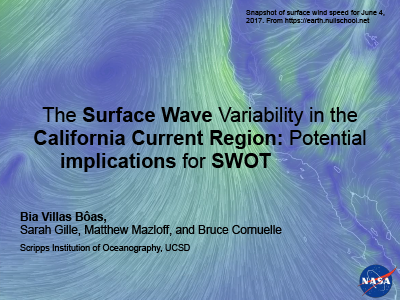 [28-Jun-17] Bôas, B.V., Gille, S., Mazloff, M., and Cornuelle, B. 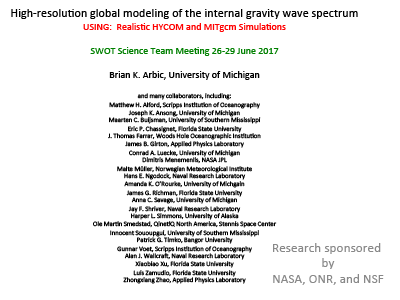 [29-Jun-17] Minear, T. and Pavelsky, T.
[27-Jun-17] Shriver, J.F., Buijsman, M.C., Arbic, B., Richman, J.G., and Savage, A. 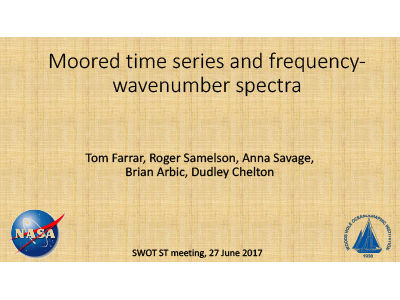 [27-Jun-17] Moriera, D. and Santos, J. 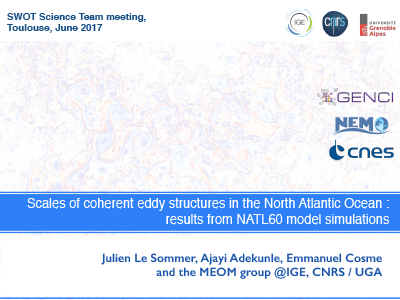 [27-Jun-17] Ray, R. and Zaron, E.
[29-Jun-17] Calmant, S. and Cretaux, J-F.
[27-Jun-17] Fjørtoft, R., Grizonnet, M., Labat-Allee, L., Lobry, S., Pena Luque, S., Poughon, V., Pourthie, N., and Williams, B.